? it’s gettin hot in here…? 31.3° celsius (~ 88.34°F) @ 11.15 p.m…..the sensor is attached to the wall outside, and inside the room it says 27,9°C…. -Inside comfortable 72°F, America rafiki, enough energy to cool down the dogs cages so they don’t have to sweat. hier am rhein ists wärmer, drinnen wie draußen. Ja ABER 1. stehen im Büro ziemlich viele Computer und Monitore, die die ganze Atmosphäre noch aufheizen und 2. handelt es sich hierbei um die Temperatur in der Nacht! Um 23:15 Uhr war es so stickig heiß, obwohl alle Fenster geöffnet waren, tagsüber die Gardinen zu und es ein Eckzimmer ist, also mit Fensterfront an zwei Seiten. Armin, I feel you in Moscow. Sorry…. 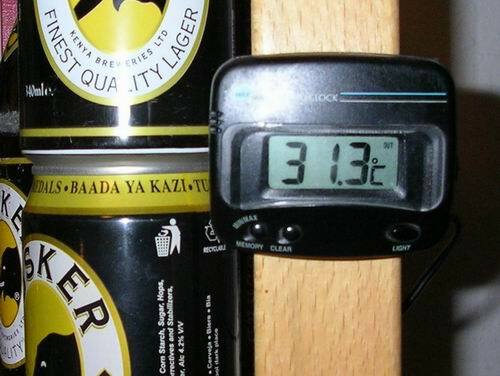 Siba….karibu ndugu. Now you make sure to take my Mbuzimoja for a shopping tour and pls teach her some american accent so that she can point with her future employers…thx!